I love a good lip balm. I own dozens but all have quite the knack of disappearing at the exact moment I need them. Either that or I just abandon them at home when I go out into the world and really need a little help in the lip hydration department. Owning all these lip balms has also helped me refine what it is that I think makes a winner. Key factors that make my lips feel safe and cozy in gale force winds are an extra thick formula, staying power (preferably overnight) and a nice scent. 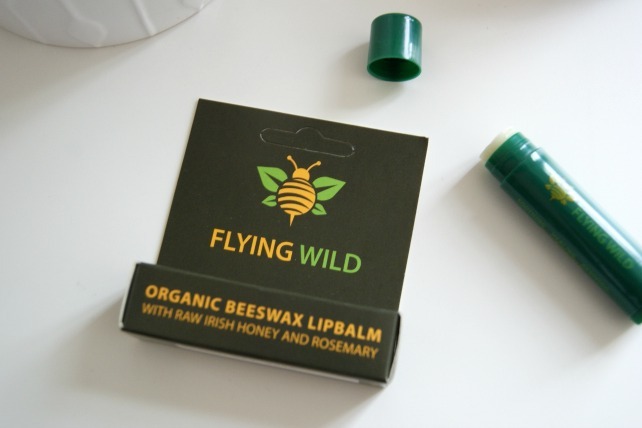 Flying Wild organic lip balm* meets all of these criteria and arrived on a day when my lips were being extra ‘challenging’. This lip balm goes on very smoothly and it’s easy to apply a good layer even at cool temperatures so it’s gentle to apply. One of my pet peeves is when a lip balm is so solid that you can’t actually get it out of it’s solid form and onto your lips to do it’s lifelong duty. This stays on your lips for a few hours during the day or leaves lips soft if put on overnight. Overnight staying power is one of my big tests and I’m pleased to say that there are still traces of this on my lips in the morning if I put a good layer on at night. It also smells beautiful – raw irish honey and rosemary, which brings me to the origins of this lovely little lip balm. Flying Wild are based in Terryglass, Ireland and are small rural business making organic beeswax based products with the philosophy that simple and natural are the way to go. The beeswax is produced from bees in their sixty hives which roam the local countryside. The ingredients are organic grapeseed oil, organic beeswax, raw Irish honey, organic oil of rosemary and vitamin E. Nice, simple and understandable. I’ve tested this lip balm for a few months so it has faced pretty miserable, wintery weather as well as sunny days and it’s held up very nicely in protecting my lips during both. 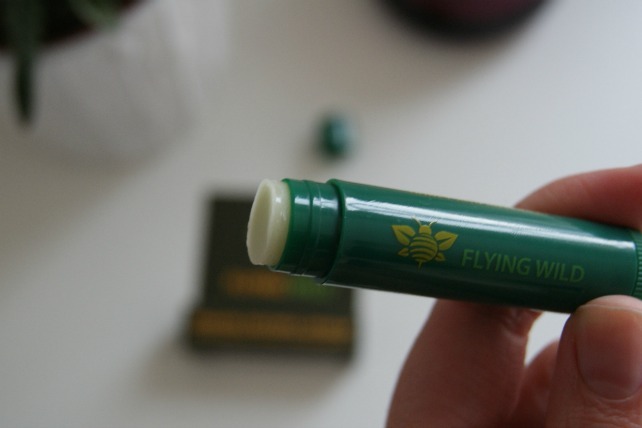 I’d highly recommend Flying Wild lip balm which is available here (with free shipping!). Flying Wild also offer a range of body, hand and foot balms if you fancy filling your basket and exploring a bit more. As always, I love reading your comments. Have you tried Flying Wild? What’s your favourite lip balm?